This fireplace screen combines a beautiful bowed front with two side panels to create a truly stunning piece that will give an elegant accent to your fireplace room. 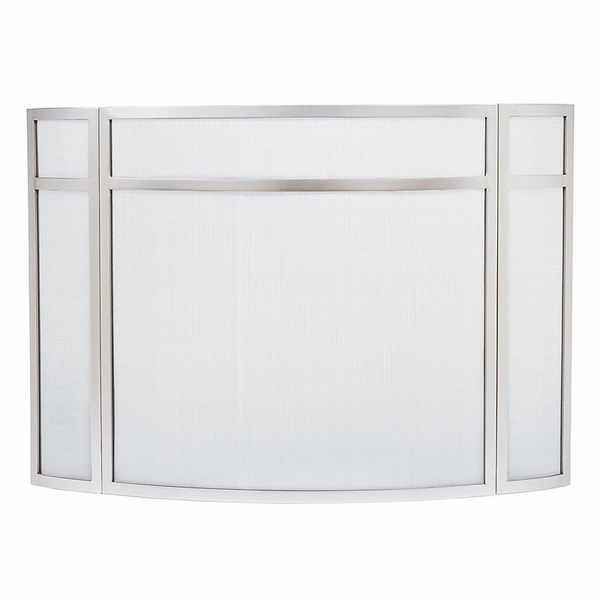 The frame is made of brushed steel in a bold linear design. Piano hinges between the panels lend extra support and protection. The center panel is 32" W x 31" H and each side panel measures 8" W x 31" H. The panel weighs approximately 32 lbs. This is the second screen. The first one had a "run" in the screen. This one is good except the screen seems loose and bends. ConsThe welded joints are not finished well. They are very noticeable. And appear a different finish. Not a well made item! Only gave 4 stars because you can see where it was welded together. My hubby says that just shows that it really is made of steel and there is no way to avoid it without painting it. We both really like it and have gotten many compliments on it. Looks modern and clean lines...we don't like things too ornate so this is perfect for us! ProsAdjustable because the two sides fold to adjust how you want it. ConsYou can see where the steel has been welded, but it still looks nice. I ordered a fireplace screen and it looks beautiful - looks like it was custom made. It is sturdy and well made. Also, it was well protected in the shipping packaging. This fireplace screen is so solid and secure that it doesnt push over easily. There are no worries with little kids around. The quality of work is first-rate! I wish I had another fireplace so I could buy another! We are thrilled with the choice of this screen! It didnt turn out to be as shiny as the picture shows, but we prefer it this way. It is not easy to knock over since it is so sturdy. It has been challenging to find just the right larger fireplace screen and even this one doesnt quite cover my 48 inch fireplace. The measurements are based on the curve of the screen, not the actual width that it will cover, so I ended up with an opening of 1 on each side. I love the style and finish of the screen and did keep it since it still seemed like the best choice. Impeccable work went into the making of this screen. The steel and joints are without fault. All eyes are drawn to a fireplace and now I have a fresh, new look by adding a screen to my living room. Practical sounds boring, but this screen is also classy and stylish and a great addition to our home.